In addition to being a registered highway open for four-wheel drives, 75-Mile Beach also doubles as an airstrip for scenic flights and- if that’s not enough- it is also home to the Pinnacles and Coloured Sands and the famous Maheno shipwreck. 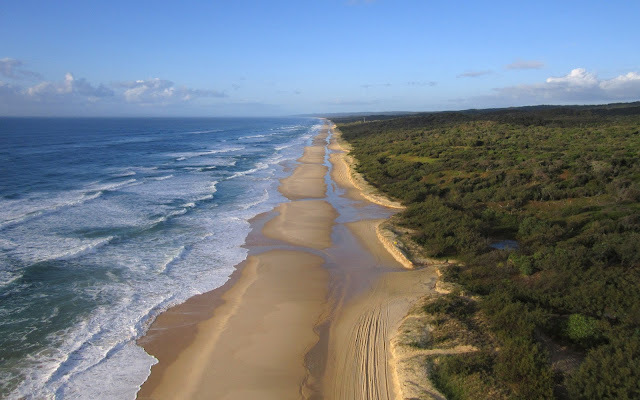 When it comes to beaches the score is Fraser Island 1- NSW-0. There’s no doubt Fraser Island is famous for its crystal clear lakes that reflect the blue sunny skies all year round. 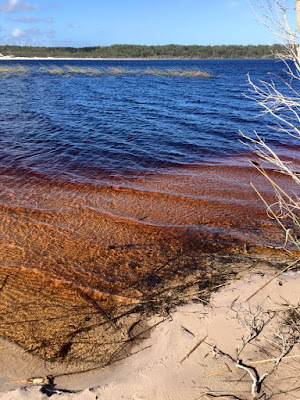 But if you want to discover the hidden gems that lie in the heart of Fraser Island-look no further than Lake Boomanjin. Located 18 kilometres south of Central Station, covering 200 hectares, it is the biggest perched lake in the world. And yes, even on a beautiful sunny day, it shows its true colours of deep orange, gold and maroon. 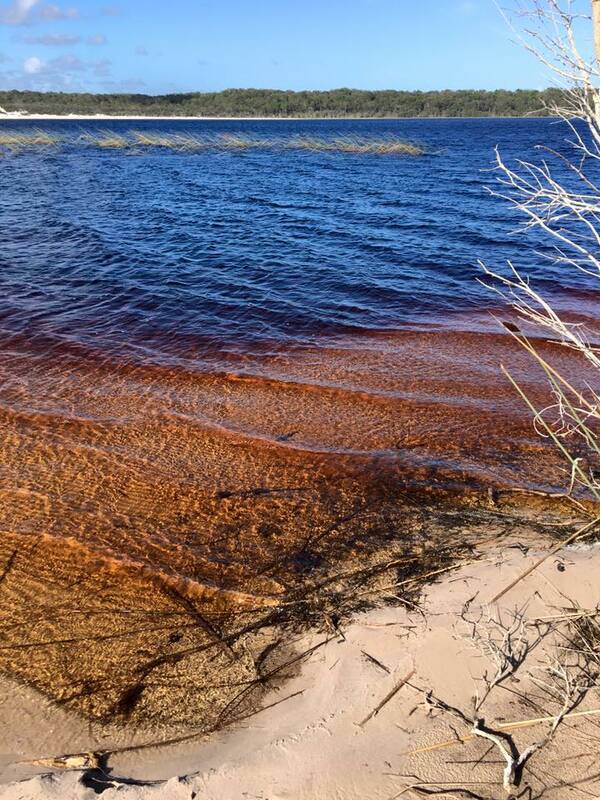 To re-cap for those watching at home, Fraser Island has bigger beaches, and now the world’s biggest perched lake. We’re going to call that Fraser Island 2- NSW 0. 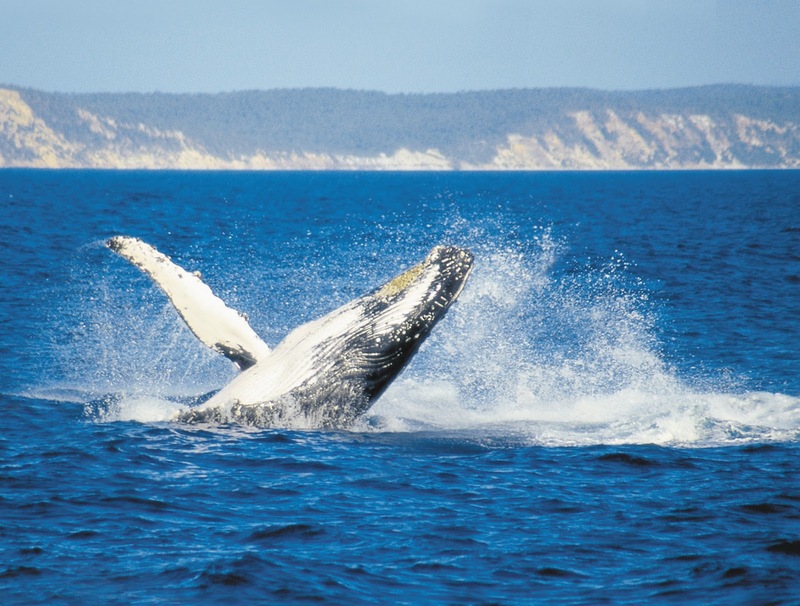 There are two populations of Humpback Whales in the world, one that reside in the northern hemisphere and roughly 20,000 in the southern hemisphere. Each year the southern Humpback Whales make a pilgrimage from their home in Antarctica north along Australia’s east coast to the warmer waters of the Great Barrier Reef. 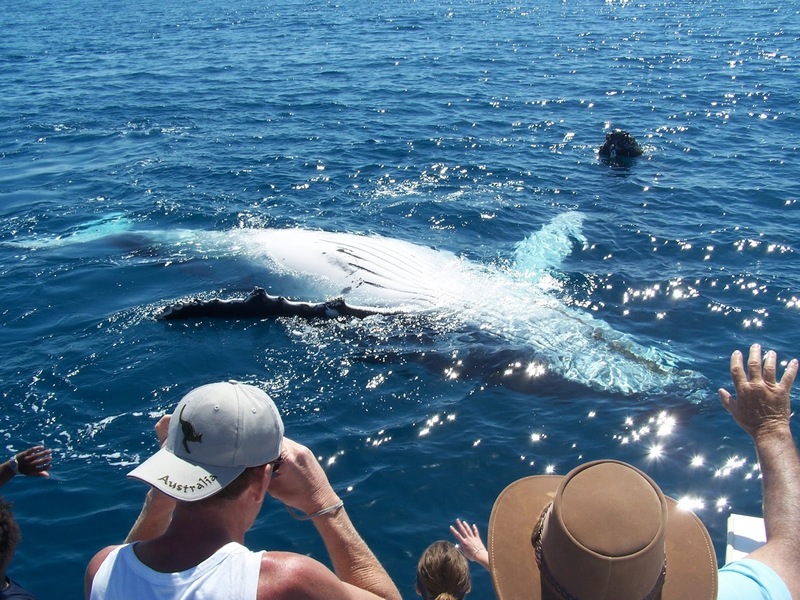 During their time on the reef the whales give birth and feed their young before returning on their southern migration. But on their journey back home, around August each year, something truly remarkable happens. They take an exit off the aquatic express and pull over for a breather in the calm protected waters between Fraser Island and Hervey Bay. With the world’s largest sand island to protect them from the currents of the open ocean, the whales can kick back and relax, feed their young and enjoy a bit of people watching. It’s the only place in Australia that they do this- and one of only two places in the world this happens. Once they’re ready to continue their journey around October they head back out to sea- past the coast of New South Wales and Victoria - to settle in to cooler waters of the Antarctic during the summer. Whales are incredibly intelligent and beautiful animals, and seeing them up close is an experience like nothing else. They know Fraser Island is the best place to relax and play on holiday and- we might be a bit biased- but we think they’re on to something. So that’s Fraser Island 3- NSW 0 at the half-time break. Plenty of football coaches will tell you that strength, endurance and teamwork are the key elements to a winning formula, and that’s true. But when you’re planning a holiday on a tropical island, let’s face it- size matters. With an area of more than 181, 000 hectares, Fraser Island stretches over 123 kilometres in length and 22 kilometres at its widest point making it the largest sand island in the world. Sometimes in life, bigger is better, and we’re not going to suggest that Fraser Island has a better Opera House than NSW, but when it comes to four-wheel driving, fishing, canoeing, exploring, swimming, paddling and hiking- there’s no better place to do it. We figure, if you’re the biggest in the world Fraser deserves to get at least one extra point, so that’s Fraser Island 4- NSW 0. Fraser Island is one of the most ecologically diverse places in the world, it’s one of the many reasons the island was inscribed on the World Heritage list by UNESCO in 1992. 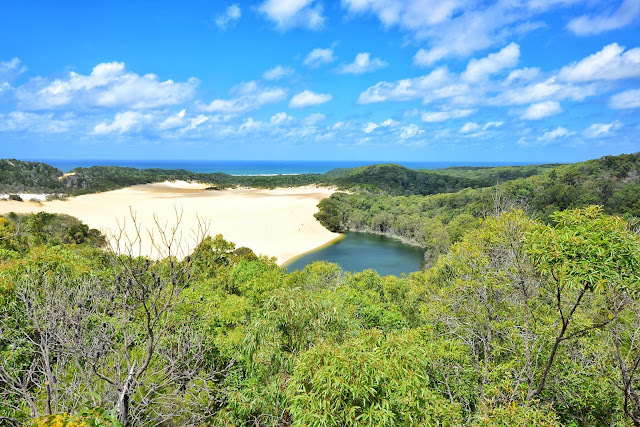 Fraser Island is home to more than 300 species of birds along with species of fish, squid, turtles, dolphins, dugong, wallabies, echidnas and- of course- the iconic Fraser Island dingo. But it’s not only the island’s incredible array of fauna that make Fraser such an incredible holiday destination. 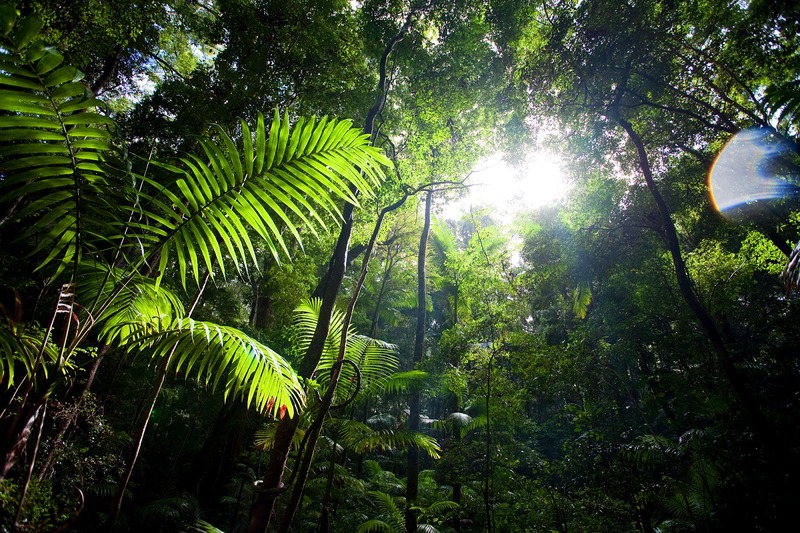 This natural wonder also happens to be the only place in the world where rainforests can be found growing out of sand at heights of over 200 metres. Walking through the pristine rainforests in the heart of Fraser Island you’ll find silent, crystal clear lakes that weave their way through the sand, pre-historic ferns and trees you can’t find anywhere else on earth. It’s one of the island’s most unique features and the fifth and final tackle in this match-up. On every measure it's easy to see that when it comes to island holiday destinations- there really is no contest against our mates south of the border. Fraser Island takes the win, with the final score line Fraser Island 5- NSW 0. The Fraser Island’s highlight reel truly is a thing of beauty, not unlike the highlights package from the most recent State of Origin series. With incredible natural beauty, iconic wildlife and unique experiences to enjoy, Fraser Island is one of Australia’s must-visit island destinations. When it comes to exploring this natural wonder there’s no better place to stay during your visit than Kingfisher Bay Resort. 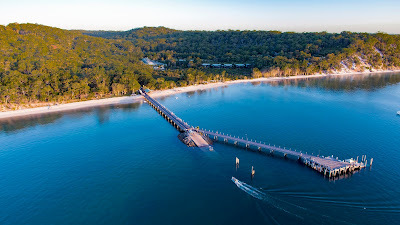 With sensational dining options, a brand new Day Spa, and a fantastic Junior Eco-Ranger Program, Kingfisher Bay Resort is the ideal location to relax, unwind and enjoy the natural surroundings. Our experienced and knowledgeable team of rangers and guides offer daily tours, bush walks, activities and more to ensure you can experience the very best of Fraser Island. And while we’ve had some fun with this blog, we promise, we will always offer a warm and sincere welcome to visitors from New South Wales.